The sight of the giant cruise ship Costa Concordia listing in the deadly embrace of the sea is a now a graphic symbol of failure. Its timing is absolutely eerie, coming so close to the 100th anniversary of the sinking of the Titanic. But, unlike the Titanic, this disaster did not take in the middle of the ocean, far from the range of observation. The Costa Concordia appears to be almost touching the rocky Italian coastline. The digital revolution ensures that we are all able to see the wreck of the ship in living color. And then came the story. It appears that Captain Francesco Schettino deliberately took the Costa Concordia off its assigned course in order to bring the giant vessel dangerously close to the Tuscan coastline so that a crew member could greet his family. During the maneuver, the ship hit a submerged outcropping of rock, tearing a massive hole in the hull. Within seconds, the Captain knew the ship was in trouble, and he brought the fast-sinking ship to rest on a reef, listing heaving on its starboard side. Within minutes, local authorities launched a rescue operation. Thankfully, the accident took place close to shore, and the captain had been able to crash the ship onto the reef, preventing it from fully sinking. Nevertheless, massive portions of the ship’s interior space quickly filled with the cold and dark water. The death toll could rise to as many as 40 or more. As of Wednesday night, eleven deaths had been confirmed, and another 24 passengers and crew remained missing. Authorities cited movement of the vessel and conditions on board as an indication that further rescues were unlikely. A flood of questions immediately surfaced. Why had the captain deliberately taken the ship off its course? What sane captain would bring a massive $450-million vessel with 4,200 passengers and crew into such clearly dangerous waters? Once the ship was compromised, were standard lifesaving practices followed? All of those questions were swirling about when a stunning development exploded its way into the conversation. An Italian newspaper, Corriere della Sera, obtained and released a recording of the Italian Coast Guard communicated with Captain Schettino after the accident. That conversation is sure to become part of maritime lore for generations to come. Italian authorities later confirmed that Captain Schettino never returned to the vessel, even when he was told that passengers remained in danger and some bodies had already been found. Across Italy, a stunned nation listened to the recorded conversation as it was broadcast by Italian media. Within an hour, the recording was available in English and a host of other languages—a transcript of shame that was so shocking it seemed to be fiction. But it was fact. Captain Schettino was arrested within hours of the wreck, and he is likely to face criminal charges including manslaughter and abandoning his ship. 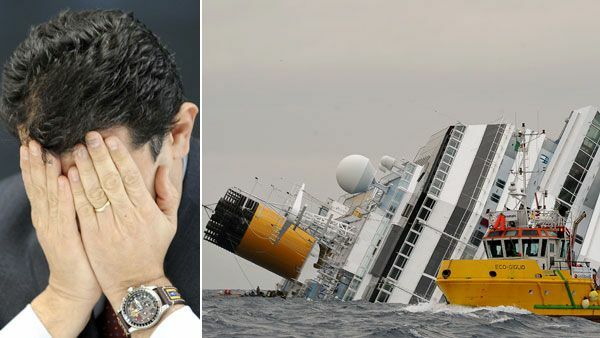 Authorities quickly blamed Schettino for the accident, once it was confirmed that he had ordered the ship to leave its assigned course and when he was confirmed to have been in control of the vessel when the accident occurred. What are we to do with Captain Schettino? He will go down in history as an example of miserable failure, dereliction of duty, radical cowardice, and the collapse of manhood. He failed to do what any man in his position would be expected to do. He even refused a direct command to take up his duty, once he had abandoned it. Thankfully, this was not the only picture to be seen. Manrico Giampedroni, a 57-year-old crew member aboard the Costa Concordia devoted himself fearlessly to the rescue of passengers, returning to the listing ship again and again to find them and return them to safety. He stopped only when he badly fractured his leg and had to be rescued himself. Francis Servel, who attempted to flee the boat with his wife, Nicole, discovered that there was only one life jacket. He put it on his wife, and that was her last sight of him. “I owe my life to my husband,” she said. Captain Schettino first told the Italian authorities that he had not abandoned his ship. He then changed his story to say that he had slipped and fallen into the rescue boat. Among the monuments on the grounds of the United States Naval Academy at Annapolis, Maryland is a massive granite marker dedicated to the memory of Commander William L. Herndon. In 1857 Commander Herndon was in command of the commercial vessel Central America, under assignment to the United States government, when it ran into hurricane force winds. Commander Herndon gave everything he had to the rescue of those in his care. He evacuated 31 women and 28 children before the ship sank into the stormy waters off Cape Hatteras, North Carolina. He gave his watch to one of the women and asked her to get it to his wife, explaining that he could not leave the ship while anyone remained on board. Survivors told of seeing Commander Herndon go down with his ship, cigar chomped in his teeth, his head bowed in prayer—a portrait of courage, devotion to his charge, and defiance of fear. Two U.S. Navy vessels have since been commissioned in his memory. Here we face two radically different men, who made radically different decisions. The decisions we make in the present will determine the kind of decision we would make in the future if we were to face the same challenge. Nothing less than the moral order of the universe is at stake when we consider the difference between Commander Herndon off of Cape Hatteras and, off of Italy, the Chicken of the Sea.